Located in the north of France with a stretch of coastline along the British Channel, Normandy is a popular holiday destination. With beautiful beaches, plentiful historical sites, enchanting nature, and diverse attractions to suit all tastes, camping in Normandy is a terrific way to explore the area. There are numerous family-friendly attractions in Normandy, as well as hidden hotspots that are ideal for romance-seeking camping couples and cool activities for groups of friends looking for a fabulous camping vacation in northern France. Campsites in Normandy offer plenty of diversity to suit all tastes and preferences, and the area is easy to explore by private vehicle or public transport. Whether you want to pitch your own tent, complete with your personal creature comforts, or enjoy the convenience of staying on a serviced site, Normandy offers the best of both worlds. Few children can resist the appeal of the seaside, and Normandy’s beaches are ideal for family fun in the sun. Trouville is a great beach for families, with varied activities, including water sports and tennis as well as children’s clubs. There’s also a swimming pool if you don’t want to get salt in your hair. Arromanches golden sands and gentle waters are close to historic places of interest, while Granville is perfect for active families who look water sports. Pretty Cabourg Beach is backed by a long promenade, ideal if you want a stroll without getting sand between your toes. Can’t wait to hit the beach after arriving by ferry? Head to Ouistreham and soak up the olde-worlde charm. St Jean Le Thomas is a prime beach destination for families looking for a calm ambience and stunning views. There are several attraction parks around the Normandy region, including Festyland near Caen, which has rides big and small for all members of the family to enjoy, and the storybook-inspired Enchanted Village at Bellefontaine. Visit the biggest aquarium in Europe at La Cite de la Mer and learn more about the underwater world. Children are also sure to love exploring the old nuclear submarine. Animal-loving children can watch an array of animals at Zoo de Jurques, complete with a Wild West theme, Zoo de Champrepus, which also has a stunning exotic botanical garden, and the exciting Cerza Safari Park. Be fascinated by gigantic reptilian beasts at Alligator Bay, which is also home to a few crocodiles and a selection of lizards and snakes. Or, for something a bit different to the norm, take the kids to Eur’Autruche, a large farm filled with ostriches and emus. As well as teaching children more about the local wartime history on your Normandy camping trip, travel farther back in time with a visit to Vieux-la-Romaine. Families can see what life was like in Roman times at the reconstructed Roman city and marvel at diverse archeological finds. Young explorers can have a subterranean adventure at Le Souterroscope des Ardoisieres at Caument. Formerly a slate quarry, the extensive cave system is filled with interesting rock formations, made even more enchanting by the imaginative lighting. Older children and teens can have a ball at Woody Park, with rope courses high in the trees, mini golf, paintball, and more. Chemin de Fer Miniature lets kids and adults alike feel like giants as they watch the quaint mini train chugging through its tiny villages and towns. The fairytale-like Mont St. Michel appeals to the imaginations of both children and adults, and the mudflats surrounding the island offer a great break from the historic streets. Normandy has plenty of romantic restaurants and bars, but what better way could there be for couples to spend an evening together than next to a glowing campfire under the stars at a remote camping area? The beaches offer plenty of ways to combine relaxation and active pursuits. Swimming, sunbathing, sailing, kayaking, and romantic strolls along the sands are just a few ways to enjoy Normandy’s long coastline. Rising up majestically from the surrounding waters, Mont St. Michel cannot help but impress. Admire the medieval abbey perched on the rocky island from a distance before strolling hand in hand through the maze of tiny streets to see traditional fishermen’s homes and admiring the architecture of La Merveille. Grab some picnic supplies for some delightful al fresco dining. There are many historic cities, towns, and villages that are brimming with culture and heritage. Soak up history and appreciate the beautiful buildings with a wander around Rouen, Alençon, Vire, Argentan, and Deauville, just to name a few. The pretty harbour at Honfleur is another lovely spot, and you can travel back in time together at places like the grand Norman fortress at Chambois and the imposing Château Gaillard in Les Andelys. A fabulous day trip for couples camping in Normandy is the stunning Monet's Garden in Giverny. Couples who enjoy outdoor explorations have many options too, including the rolling countryside around Mont-Ormel. Of course, no first-time visit to Normandy would be fully complete without visiting the historic D-Day landing sites and feasting your eyes on the magnificent Bayeux Tapestry. 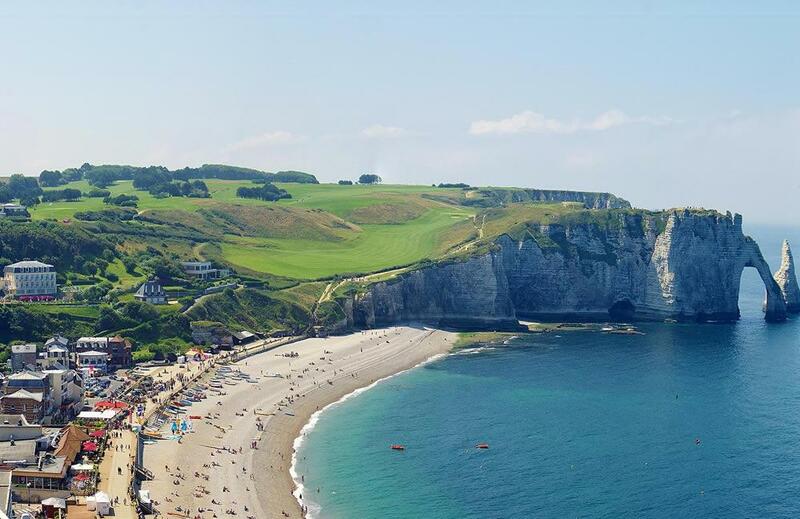 The dramatic white limestone cliffs of Étretat are incredibly picturesque and perfectly photogenic, while the countryside area of Suisse Normande is a prime destination for those who enjoy spending quality time in nature and indulging in a range of outdoor pursuits. Hiking, biking, climbing, kayaking, and canoeing are just a few ways to get active in Suisse Normande. Sparkling lakes, flourishing forests, and verdant undulating hills help to create a postcard-worthy landscape. Other major attractions in Normandy include the spectacular Château de Fontaine-Henry, bustling Le Havre, Tatihou Island, and the interesting Memorial Museum of the Battle of Normandy. Repeat visitors to Normandy will still find plenty to keep them occupied on their camping trip. Visit the Grand Île of Îles Chausey for quiet beaches and a feeling of remoteness. Snap some pictures of the unusual Tour de Bonvouloir. Explore Roman ruins at Jublains. Enter a world of luxury at the Christian Dior Museum in Granville. Admire the half-timbered buildings and diverse collections at Chateau de Crevecoeur. Explore the countryside from the cute village of Foulognes. Soak up the vistas from Cap de la Hague. Drive along new roads and you’re sure to chance upon something new and interesting! No camping break in Normandy would be complete without sampling some of the region’s delicious food and drinks. Stock up in local supermarkets, butchers, bakeries, patisseries, and delicatessens, or treat yourself to a few meals away from your tent. Of course, part of the fun of camping is the joy of preparing your own meals, but it would be a shame to miss tasting Normandy’s specialities too. The coastal location makes Normandy is a great place for fans of seafood and bounties from the ocean. Fresh mussels, oysters, lobster, sole, and scallops are especially abundant. The region produces several excellent cheeses and a favourite meal is chicken with calvados and cream. Other dishes to try include Caen tripe, Rouen duck, Mortagne sausages, and the fluffy omelettes from Mont St. Michel. If you’ve still got some space left for dessert, savour apple sugars, bourdelots, apple tart, and toffees. With plentiful apples produced in Normandy, sip a glass of cider, perry, or apple brandy before, during, or after your meal. Any time is good! There are several ways of getting to Normandy from the UK and Ireland. The small Deauville – Normandie Airport (DOL) operates seasonal flights (over the summer months) to the UK. People living in the south of England may find it convenient to fly directly from London Stansted with Ryanair. Those coming from other parts of the UK and Ireland and who wish to travel by air can connect through Stansted, Paris, or other French airports. There are regular bus and train connections from Paris to Normandy. Other airports serve the region too. Caen-Carpiquet Airport (CPR) has regular flights to and from London Stansted with Flybe, as well as flights around France with Air France (operated by HOP! ), Volotea, and Chalair Aviation. Another option is Dinard–Pleurtuit–Saint-Malo Airport (DNR). Ryanair has year-round services to London Stansted as well as seasonal flights to and from Leeds/Bradford and the East Midlands. Reaching Normandy and the north of France by ferry is another population option. Regular services run between Portsmouth and Caen, from Portsmouth and Poole to Cherbourg, from Portsmouth to Le Havre, and between Newhaven and Dieppe. The Channel Tunnel is another good way to reach France from the south of England, especially for people wishing to travel with their own vehicle; it’s a short drive from Calais to Normandy. Road conditions around Normandy are generally very good. Remember, though, that people drive on the right in France, the opposite side of the road to in the UK and Ireland. Sign-posting is also good, with many places of interest easy to reach by road. Whether you travel to France with your on vehicle or rent a car once you arrive, many campers love the freedom of having their own transportation to fully explore the area. If you do plan to hire a car for your Normandy camping trip, and will be travelling through Paris, it is advisable to arrange to collect your vehicle when you arrive in Normandy rather than having the hassle of driving up from (and back down to) Paris. The region is also well-connected by efficient and frequent rail and bus services. Some of the more remote campsites may, however, require a private vehicle or a taxi to get to. Some off-the-beaten-track sites offer pickups from nearby bus or train stations for convenience. While there is something to see and do in the region’s cities and towns all throughout the year, camping experiences are best from spring to autumn. Summer is the best time to visit for people who want to enjoy sunny days on the beach, though this is when the area will also be more crowded. School holidays in particular see large numbers of tourists. Prices are often at their highest at this time. Going just before or after the school vacations is ideal for people who want to enjoy warm and sunny weather but benefit from slightly lower prices and fewer crowds. Look for deals in the shoulder season if you prefer more of a tranquil vacation. Month by month, April is still on the cool side, although camping can still be very pleasant. The weather is warmer in June but the area is still relatively uncrowded. July and August are the peak holiday months in Normandy. This is when the area generally sees the hottest conditions, the most hours of sunlight, and the biggest tourist numbers. By mid-September, many of the crowds have died down, and the weather is still pleasantly warm. October is cool but the changing colours of the countryside can still make this a nice time to explore Normandy. Do keep in mind that the weather in Normandy can be unpredictable. It does rail occasionally during the summer months, when people generally expect sunshine, and there are many beautifully dry and sunny days in April and October to offset the cooler days. Camping is the ideal way for people to enjoy Normandy on a budget. While prices naturally vary depending on the campsite and the season, as well as whether you take your own tent or stay in a ready-erected tent, you can expect to pay in the region of 5-10 EUR per night. Over and above that you have plenty of on-site accommodation for rental. Goods in supermarkets are reasonably priced, making self-catering and picnicking a pleasure. Many campsites, especially in the region’s more rural areas, have onsite restaurants. Prices are generally affordable for traditional farm-style fare. Look for set lunchtime menus in restaurants to make more savings on eating out during the day times. Bakeries can also be a great option for a quick breakfast or lunch on the go. The price of a one-way plane ticket (from London or Paris) to Normandy is often similar to the cost of a one-way ferry crossing, with a car, from the south of England. Expect to pay in the region of around 50 EUR, possibly more. That said, it is often possible to find great deals on flights, especially if you book in advance; 20 EUR fares are not uncommon. There are many ways to enjoy Normandy on a varied camping vacation and, with so many things to see and do, there’s no need for a single dull moment. Offering the perfect blend of attractions and activities to suit diverse preferences, Normandy is a fantastic all-round camping destination in France. Book your camping stay, or stays, right here on Campsited and find out for yourself why so many people cannot help but fall under the charms of this northern French gem.